Enjoy a unit with all the amenities in the finest luxury resort in South Lake Tahoe. You save by renting directly from the us, the units owner and still enjoying full usage of the Grand Residence Club at prices much lower than Marriot's. The resort is architecturally designed in rustic mountain elegance and located in the newly developed "Heart of the Village" adjacent to the Heavenly Gondola and steps away from casinos, restaurants and shopping. * - Our 940 square foot plus unit includes the features of native pine and ceramics, 9-foot ceilings and a kitchen with granite countertops. * - 6 people sleep easily in this unit with two comfortable queen-size beds in the bedroom and a queen-size sofa sleeper in the living room of the studio. * - The studio and bedroom each has a full-size bath and they both can be entered from a separate entrance if privacy is desired. * - Jacuzzi tub in the studio bathroom. * - Bedroom opens to a private deck with chairs. * - Free underground valet parking for one vehicle greets you upon arrival. * - Bell and concierge services eagerly available for your assistance. * - Access to the beach club on Lake Tahoe included with rental. * - Located around and in the resort are restaurants, ski rental, skating rink and shopping. * - Spa and Fitness center included with the resort. * - Across the street is a full size grocery store with deli and bakery. * - Multi-screen movie theatre just out the back door of the resort. * Maid fee of $111.00, paid at check-out. * Policy: 50% to hold reservation; 50% DUE 30 days prior to check-in. * Cancellation Policy: 30 Days 100% - 14 Days 50%. * Check-In 4:00 PM and Check-Out 11:00 AM. * Linens and Towels included with room. * Entire unit sleeps 6. * Daily maid service is available at an additional charge. Linda and I are from Minnesota and grew up enjoying the outdoors during all four seasons. Skiing in the winter, boating in the summer and hiking anytime are some of our favorites. We have become foodies and I am known to enjoy a fine wine now and then. Travel and the thrill of discovering new vistas keep us on the move. We have five children and family gatherings are our favorite treasure. 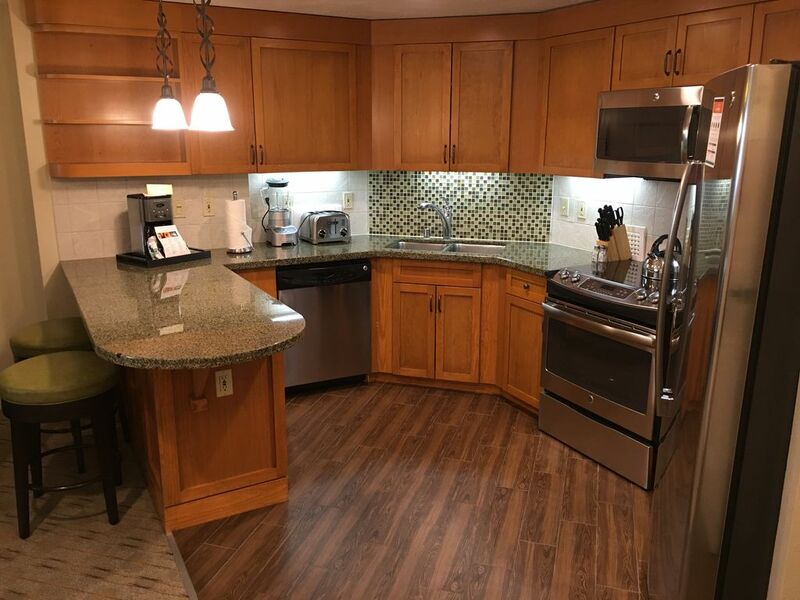 We chose the Marriott Grand Residence in South Lake Tahoe because of the great central location to outdoor activities, good restaurants and entertainment. The Heavenly gondola starts right next to our resort and we are within a short walk to casinos, the Lake and many comforts. The Marriott offers luxery in the beautiful outdoor setting of Lake Tahoe. Our unit is located in the heart of the new Heavenly central square. The resort offers an end of day escape to your dusty hiking boots or snow covered skis. Relax in the outdoor pool and hot tubs or be rejuvenated in the onsite spas. The unit is a quiet escape located near any activity you care to participate in. Unit had room to spare for our family of 3. Includes 2 adjoining rooms--one like a regular 2 queen hotel room, and one studio with kitchen and pullout sofa (which was very comfortable). Location is excellent--convenient to gondola, restaurants, etc. View is just of front drive/entrance. Unit and property as a whole are well maintained, and owner was responsive, helpful, and easy to work with. We'd be happy to go back. The condo was perfect for my wife and I. It was clean, well furnished and had a complete supply of kitchen utensils. It is perfect for a family of six or less and close to everything one might need. Lovely unit close to all the action. Easy check in. We loved staying at this condo. It was very nice, well located and had a great feel. I only gave it one less star because the resort did not have our room ready until right at 4. We always stay here and book through Heavenly condos and our room is ready as early as 1pm. Not sure if it was because it was an owner or what. Otherwise we loved this place. We were in a wonderful spot easy access to everything! Room was our home away from home, had everything and anything we needed was immediately provided for us by the front desk. Loved having access to both properties and free parking! There is a $111.00 cleaning fee due at check out, payable to the Marriott.